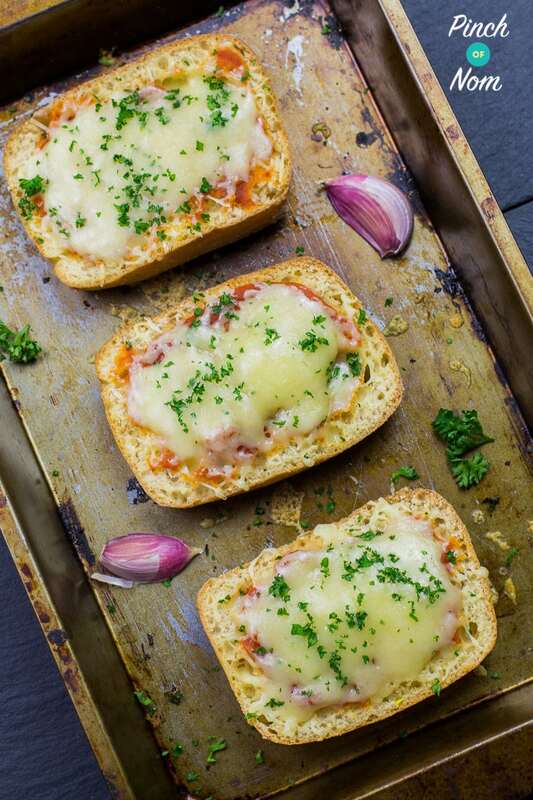 This Cheesy Garlic Bread is the best accompaniment to all our favourite dishes – and it’s perfect for Slimming World, Weight Watchers or Calorie Counting plans! We adore Cheesy Garlic Bread. If we could… we’d have it with every meal till the end of days! Garlic bread using Wholemeal bread doesn’t sound like our idea of fun, so we made this Cheesy Garlic Bread using Schar White Ciabatta. 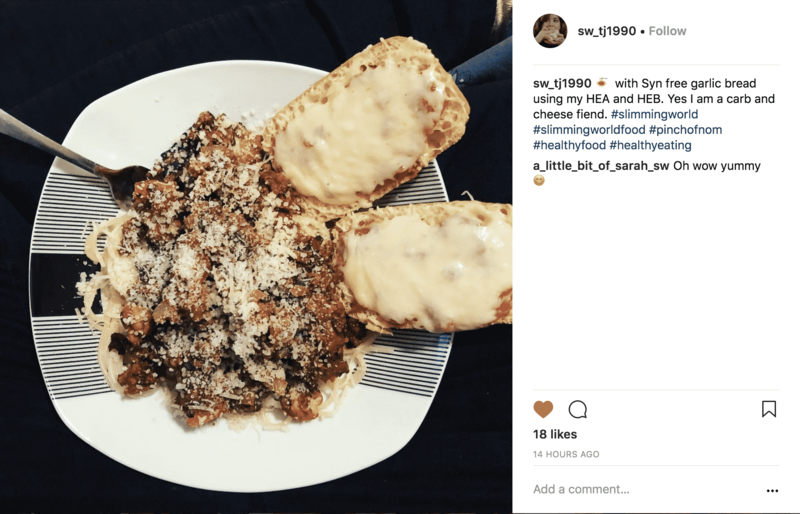 How many Syns are in this Cheesy Garlic Bread? 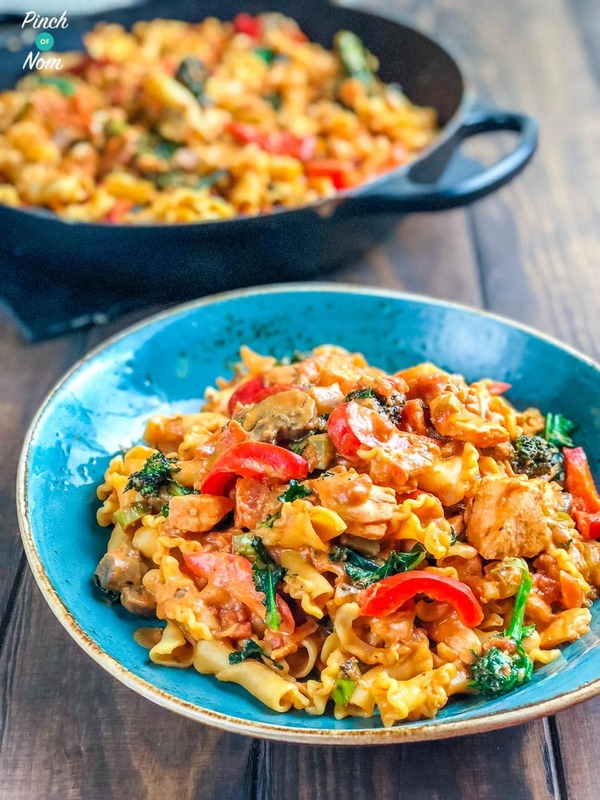 You might be sat there asking yourself, how exactly can this by Syn free. Well, it can only be Syn free if you use some of one of your Healthy Extra A allowances as well as your Health Extra B. Each piece of Cheesy Garlic Bread is half of a white Schar Ciabatta. Half of a Schar Ciabatta is 1/2 your HEB. If you use Light Cheddar then you use just 1/4 of one of your Healthy Extra A’s per piece (10g on each). 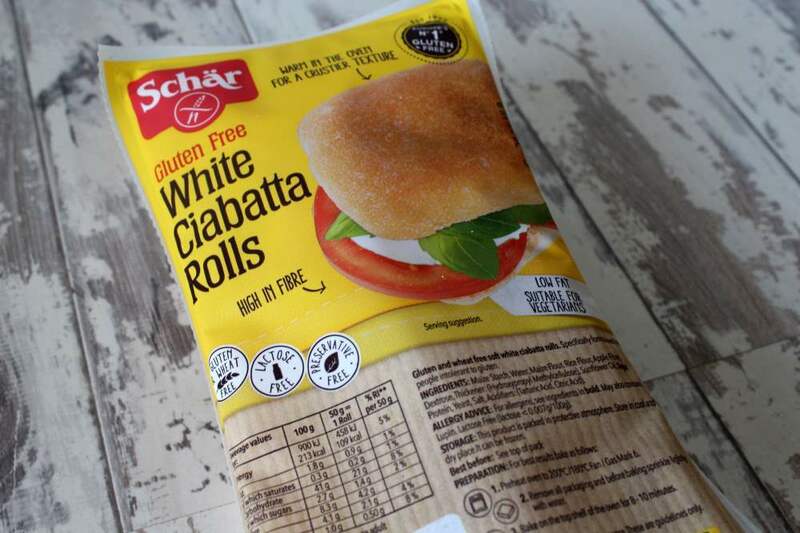 You can find Schar Ciabattas in the Free From aisle of most supermarkets. You can also buy them from the Schar online shop. 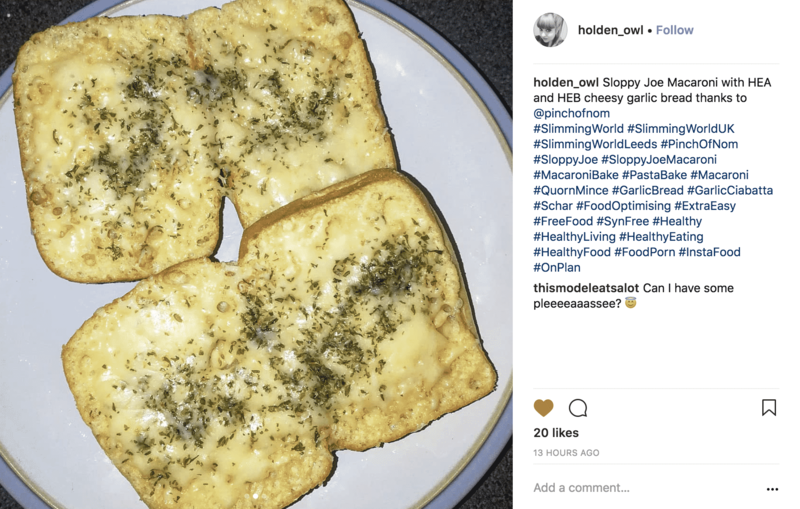 You could even serve this Cheesy Garlic Bread as a light lunch with some salad or veg – why not choose something from our Slimming World Speed Food List? How Weight Watchers friendly is this Cheesy Garlic Bread recipe? Shop or restaurant bought cheese garlic bread can set you back anything from 5 to 25 points. 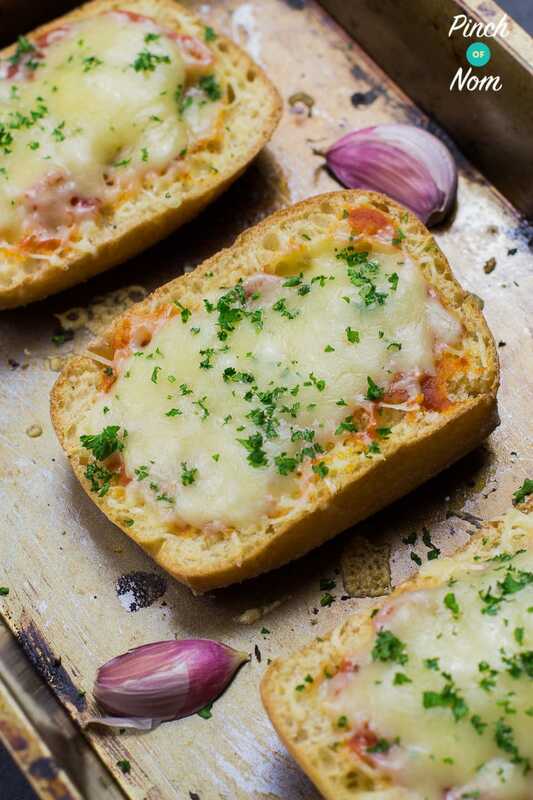 Our Cheesy Garlic Bread is just 3 Points per portion – you’ll never want to buy it ready made again! 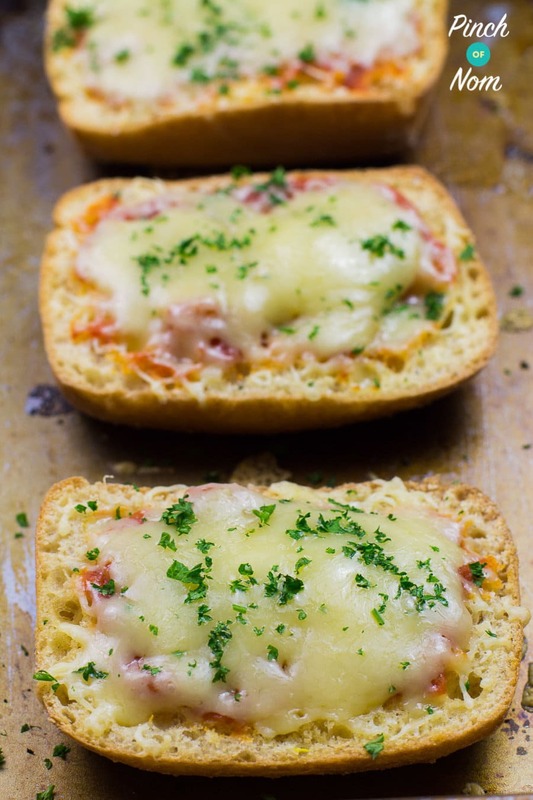 Why not have this Cheesy Garlic Bread as a side dish to our Creamy Tomato Pasta? How many Calories are in this Cheesy Garlic Bread? A standard, shop bought slice of Cheesy Garlic Bread has around 125 calories. Our version has just 85 calories, but without losing any of the amazing flavour! Wait! So this Cheesy Garlic Bread doesn’t use butter?! Correct! No butter at all. How? We used a quick spray of Low Calorie Cooking Spray. A couple of sprays on each is all that you’d need. Some of you love this Cheesy Garlic Bread recipe! One of our Instagram followers @sw_tj1990 made this dish and loved it! Another of our Instagram followers @holden_owl made this dish and loved it too! What do I need to make this Cheesy Garlic Bread? You might think that this recipe uses a tiny amount of cheese. 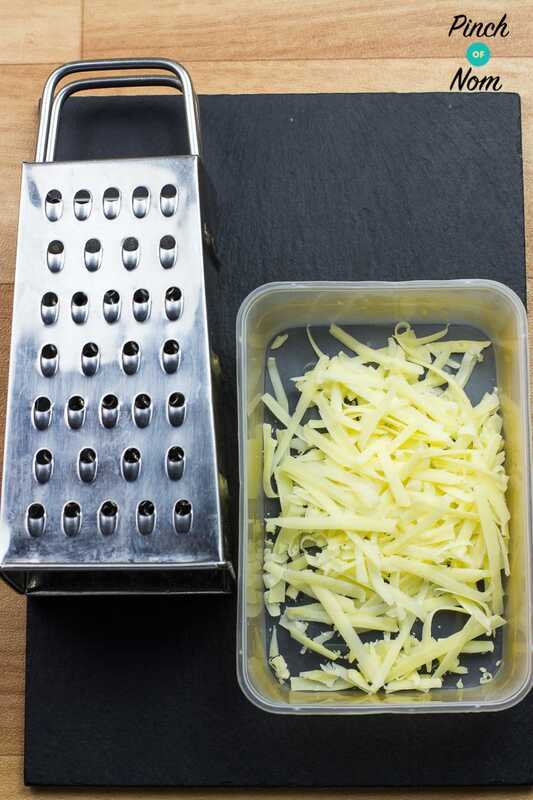 Take a look at the image below.. this is how much cheese you get when grate 40g of cheese with a regular box grater. Whist it looks like a lot, when you try and spread it around a piece of toast or two, you’re not going to get very far. 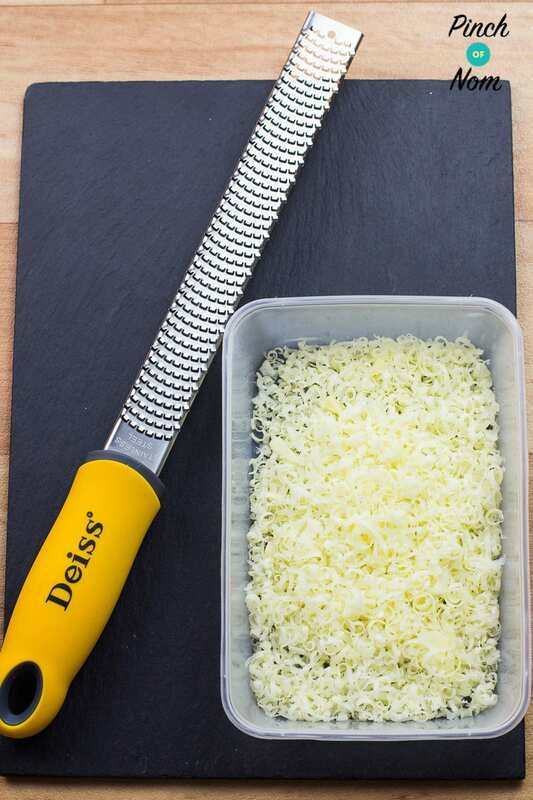 Below you see the exact same amount of cheese (40g) grated using our new snazzy Deiss grater! 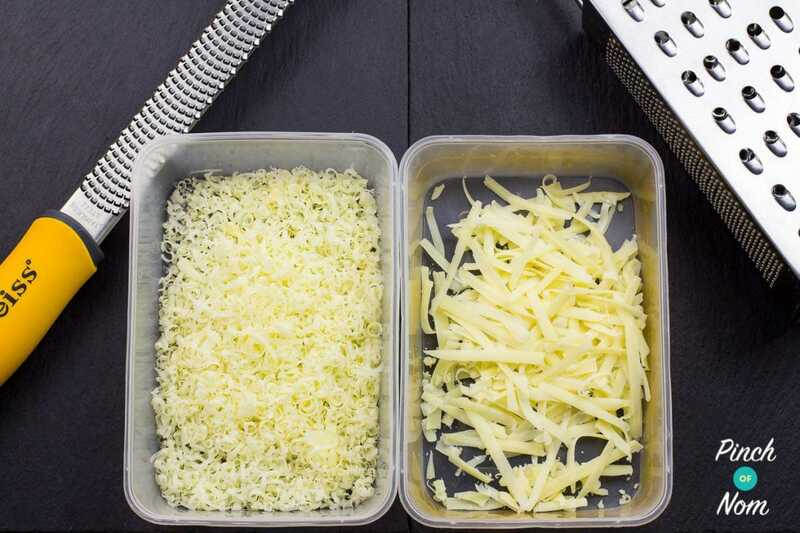 By grating the cheese finer, it goes a LOT further! It’s really remarkable how much more it looks like you get, just by grating it finer. Do you put tomato on your Cheesy Garlic Bread? Yes, we do, the more vegetables the better, right? We used a tomato sauce that we make in the pressure cooker/slow cooker and that recipe will be up very soon. You can use some tomatoes/chopped tomatoes under the cheese. Makes it taste fab! How do I make this Cheesy Garlic Bread? Bash the garlic with the back of a knife and rub the ciabatta well. If you like your garlic bread very garlicky then chop finely and scatter on the ciabatta. Take them out of the oven, top with tomatoes & cheese and scatter some of the parsley on top. Return to the oven until the cheese has melted. Enjoy! Want some Pasta dishes to go with this Cheesy Garlic Bread? 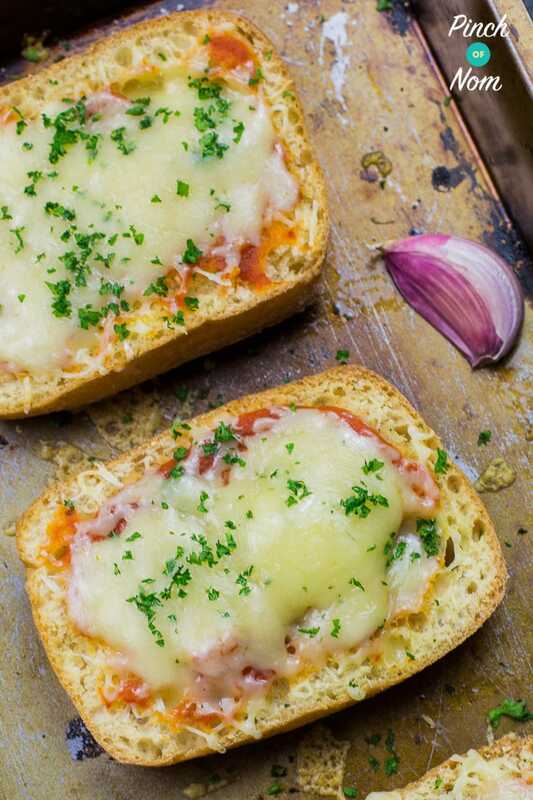 Pin this Cheesy Garlic Bread Recipe on Pinterest! Hi, where do I get the Schar white ciabatta from please ? I take it this is part of or all of my HEB ? I really like the sound of this and can’t wait to try it. Asda, Tesco and Sainsburys usually stock them. Schar also have an online store if you can’t get hold of them, which is linked to in the article. One whole ciabatta is your HEB, so you could either use all of your HEB or half. Hey – if not using as HEB what would syn be for this please? 😊 Thanks in advance! The SlimmingWorld app says the ciabatta is 5 syns, how is this recipe Sun free? how many syns is the ciabatta if we dont use it as a HE? Hello. Do you know if it’s still syn free if the brown ciabatta rolls are used instead of white? Hello. 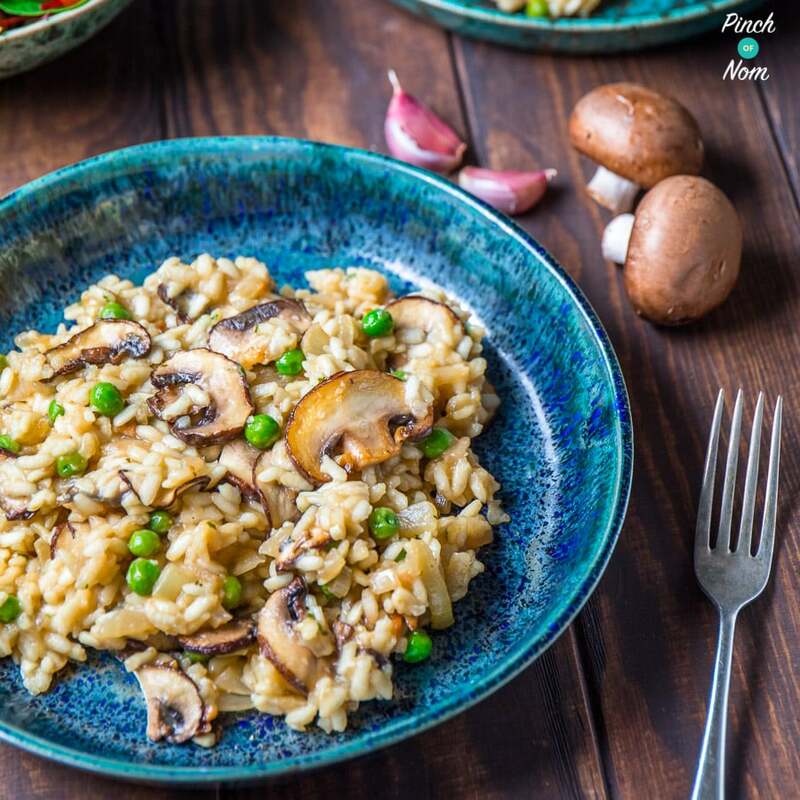 Could you use the garlic fry light instead of the olive oil and a garlic cloves? Thanks. As I’m not allowed to eat anything with pips in I used the flesh of fresh tomatoes mixed with a little passata. This will not alter the values will it? Tried these last week, totally lush. Sooo missed garlic bread. On the second lot I made I had run out of fresh garlic so used the garlic fry light & it works just as well. I made these tonight…. Absolutely deeeelish!!! This may well have been a time-sensitive offer. Thanks for getting in touch though. Just so I know I’ve got this right, if only using 1/4 of HeA of cheese (10g per half ciabatta) I would then still have half of my HeA left for the day? It says that half a ciabatta is half your heB is that correct? The SW app lists 1 x Schar ciabatta roll as an HEb choice, so yes, half a ciabatta roll (one piece of the garlic bread recipe) is half your HEb. Hope that helps. Hi Can I be any gluten free ciabatta bread. Can I use tinned tomatoes or does it have to be fresh tomatoes? if so do I mash the tomatoes down? You can use tinned tomatoes, but you’ll need to drain them really well so that it doesn’t make the bread soggy!